Every day more than 39,000 children are injured seriously enough to require medical treatment, totaling more than 14 million children each year. Within a 12-month period, injuries to children ages 14 and under result in 223,000 hospitalizations, nearly 8.7 million emergency room visits, and more than 12 million visits to physicians’ offices. In addition, each year more than 120,000 children are permanently disabled. Ironically, the cause of severe trauma isn’t always obvious, especially in children. That is what makes a Pediatric Trauma Center, with specialized equipment for children and an experienced pediatric trauma staff, so important. Children need diagnostic and treatment tools scaled to their small size, such as blood pressure cuffs, tubing, or warmers to heat blood for transfusions because their small bodies can change temperature so quickly. Children are not miniature adults. They react differently to injury and they have different symptoms of distress so they need doctors and nurses who know what to look for when diagnosing pediatric trauma. They respond differently to trauma. Understanding the differences can be critical. At least 25 percent of those children’s lives could be saved and their disabilities reduced or eliminated with the establishment of a fully staffed, optimally equipped pediatric trauma center, supported by appropriately trained out patient care providers and safety programs. Because of the huge commitment needed in money and staff, it takes a regional approach to create a pediatric trauma center with extensive medical and associated safety and support programs. Only a major teaching center, such as Cohen’s Children’s Medical Center in Manhasset now a member of the North Shore-Long Island Jewish Health System, with its many resources, can even consider such an undertaking. But the hospital by itself can address only half the problem. 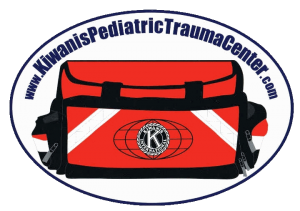 Kiwanis, the clubs of the New York District, and the KPTC Foundation provide the additional necessary components. The nature of Kiwanis as a network of volunteers organized into local clubs dedicated to community service and improving the quality of life meshes perfectly with the mission of a major medical center.